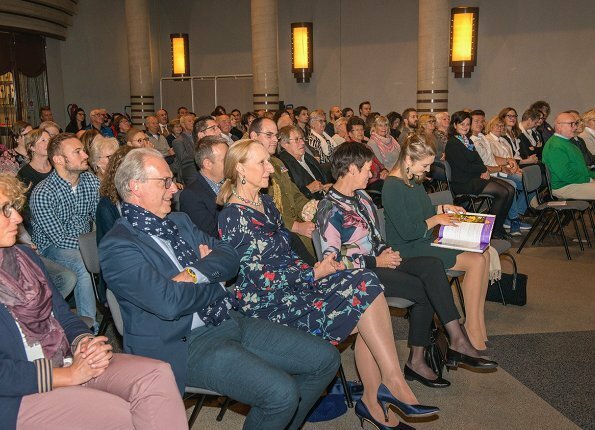 On October 29, 2017, Hereditary Grand Duchess Stéphanie of Luxembourg attended a conference that was held by BLËTZ, Asbl at Bettembourg Castle, on the occasion of World Stroke Day 2017. 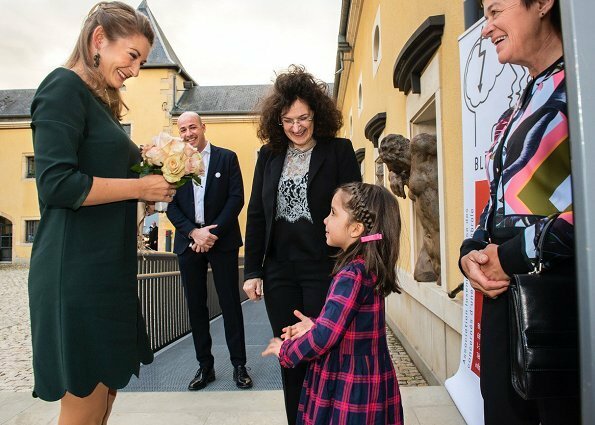 Hereditary Grand Duchess Stéphanie is patron of the BLËTZ asbl (Letzebuerger Association), since July 6, 2017. 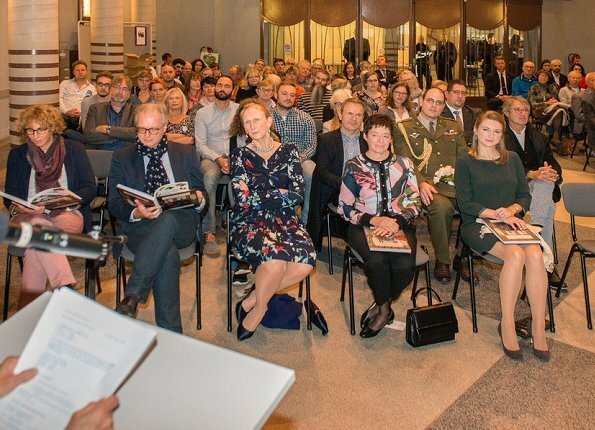 (The aim of the association Bletz is to help people with a stroke and ensure integration of disabled into society, while improving the living conditions of stroke survivors). Beautiful smile, fresh make up, nice hairdo... awful dress without shape except for the wavy hem. She looks lovely, this is nice green to her. Maybe the dress is shapeless for a reason? The colour is a tad dull. Needs a pick-me-up in form of a scarf or some piece of jewellery. I think the colour is right and what lacks is a brooch and earrings in a different one, for instance dark red.In any way, she looks lovely. I like the dress, and the hem detail adds gentle impact. The colour looks nice on her. She looks lovely! The dress is good, a nice background for a scarf or jacket, perhaps we shall see as Autumn progresses into Winter. When I was that age, I was encouraged to wear short dresses while I still had good knees, now I see why. Hope she is enjoying. As for Philanthropy PR, a two for one deal. A subtle plug for literacy since S. is reading a page in the book, as well as attention for the main topic; recovering from a stroke. Good photos.